Earth has been invade. Twice. Thousands of years ago by a race searching for a new power source. More recently by the galactic marauders known as the Cat-People, who intend to continue the work done by the earlier visitors, with devastating results. The recently regenerated Doctor, along with companions Ben and Polly, teams up with a group of amateur ghost-hunters and a mysterious white witch on a journey that takes them from twentieth-century Cumbria to the Arabian deserts of folklore and Australia 40,000 years in the past. Can the Doctor stop the invaders and disarm the bombs left buried beneath the planet's surface - or have the ancient Aborigines of Australia sung the seeds of their own destruction? Is this book the cat's meow? Or does this story belong in the litter box? Listen in and find out as we retrace and review Invasion of the Cat-People! Email us questions or comments at DWBCPodcast@gmail.com and follow us on Twitter via @DWBCPodcast. You can also follow Erik on Twitter via @sjcaustenite and Sean via @tardistavern. It is Russia, 1916, and Europe is in the grip of the Great War. With the TARDIS missing, its crew find themselves trapped in a country on the brink of revolution. David A. McIntee also wrote The Lords of the Storm, The Shadow of Weng-Chiang, White Darkness, and The Dark Path, all of which we've discussed previously. The Wages of Sin stands out as one of the few (if not the only) historical novels in the Third Doctor's range of stories. Feel free to email us at dwbcpodcast@gmail.com, follow us on Twitter via @dwbcpodcast, and look for our page on Facebook. You can also follow Sean via @tardistavern, Felicity via @feliopolis, and Erik via @sjcaustenite. You may remember Paul Leonard from the Virgin Missing Adventure Dancing the Code, which we reviewed back in Episode 44. He also brought us Speed of Flight, Toy Soldiers, and Genocide. Have a question or comment for the hosts? Email us at dwbcpodcast@gmail.com, follow us on Twitter via @dwbcpodcast, and "like" us on Facebook. You can also follow Erik on Twitter via @sjcaustenite and Sean via @tardistavern. England, 1999: the Doctor and Mel have come to London to celebrate the new year with old friends - and to heal old wounds. But others are making more sinister preparation to usher in the new millennium. A software house is about to run a program that will change the fabric of reality. And an entity older than the universe is soon to be reborn. When Anne Travers' fear of the Great Intelligence and millionaire philanthropist Ashley Chapel's secret researches combine, London is transformed into a dark and twisted mirror image populated by demons and sorcerers. Only the Doctor can put things right, but his friends have also been shockingly changed and he cannot trust anybody - least of all himself. Hinton has written a small handful of books for three different ranges of Doctor Who novels, and this is the first time we've read any of his work. Fun Fact: he was the person to originally coin the term "fanwank", which he proudly used to describe his own work. Pour yourself some very old scotch from a very old decanter and sit back and relax as we review Craig Hinton's Millennial Rites. You can send us questions or comments to dwbcpodcast@gmail.com, follow Erik on Twitter @sjcaustenite and Sean @tardistavern. Collecting his mail in the London of 2012, the Doctor and Ace are called through time to south-east Scotland to help out an old friend - an old friend who's vanished. They find themselves at Graystairs, an Alzheimer's clinic and a place of healing, where the patients seem to be gaining a new lease of life. But whose life is it? Relative Dementias is set squarely between "Battlefield" and "Ghost Light". Mark Michalowski, aside from a number of short stories for the Short Trips series and scripts for Big Finish in the Iris Wildthyme series, also wrote the BBC Eighth Doctor Adventure Halflife. Grab a pint, sit back, and relax as we discuss Relative Dementias. Have a question or comment for Erik or Sean? You can email them at dwbcpodcast@gmail.com, follow them on Twitter @sjcaustenite and @tardistavern, as well as @dwbcpodcast. Some want to coexist with humans, using genetic engineering in a macabre experiment to find a new source of blood. But some would rather go out in a blaze of glory - and UNIT's attempts to contain them could provoke another devestating war. The Doctor strikes a dangerous bargain, but even he might not be able to keep the city from getting caught in the crossfire. While he finds himself caught in a web of old feuds and high-tech scheme, his new companion Sam finds out just how deadly traveling with the Doctor can be. Kate Orman wrote the Virgin New Adventure The Room with No Doors (for which her co-author and future husband Jonathan Blum was a contributor), and that's a tough act to follow based on our review. Without further ado, sit back, relax, pour yourself a glass of synthetic blood, and listen in as we talk about Vampire Science. You can "like" us on Facebook, email us at dwbcpodcast@gmail.com, and follow us on Twitter @dwbcpodcast. You can also follow Erik @sjcaustenite and Sean @tardistavern. For thousands of years the Sontaran clone-warriors and the Rustan gestalt have fought each other across the galaxy. Now the Sontarans have a plan to strike at the heart of the Rutan Empire, and utterly defeat the Rutan race. The Doctor has his suspicions, but only one Rutan spy knows the Sontarans' secret. He is being pursued from planet to planet by Cwej and Forrester and by a Sontaran hit squad. After a confrontation about the racing space-yacht Tiger Moth, the chase culimates on the library planet Sentarion - where Professor Bernice Summerfield's researches into the history of the Sontaran/Rutan war turn into explosive reality. 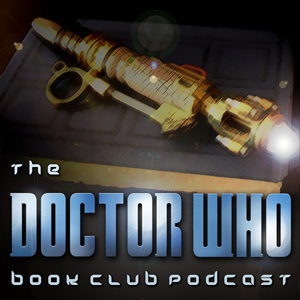 Although Terrance Dicks is known primarily as the show's script editor and author of the Target novelizations, he has written a handful of novels for the different ranges, including The Eight Doctors and World Game, both of which we have discussed on earlier episodes. So sit back and relax with a glass of rekkar (with a beer chaser) and listen in as we talk about Shakedown. Email us at dwbcpodcast@gmail.com and follow us on Twitter via @dwbcpodcast. You can also follow Erik via @sjcaustenite and Sean via @tardistavern. The human colony world of Raghi is crucial to that victory. When the Doctor and Turlough arrive there, they find a seemingly stable society ruled by a strict caste system. But all is not as it seems. Members of the lower caste are being struck down by a mysterious illness. People are vanishing in their hundreds. And strange objects have been observed oribiting the sun. Lords of the Storm is remarkable in that not only is it one of the few books to feature the Sontarans or Turlough, but is a prequel to the Virgin New Adventure Shakedown. As part of a shart arc, we will discussing Shakedown in Episode 54 next month. Please email us feedback at dwbcpodcast@gmail.com and follow us on Twitter via @dwbcpodcast. You can also follow Erik via @sjcaustenite and Sean via @tardistavern. Lords of the Storm is remarkable in that not only is it one of the few books to feature the Sontarans or Turlough, but is a prequel to the Virgin New Adventure Shakedown. As part of a short arc, we will discussing Shakedown in Episode 54 next month. The TARDIS arrives in Salem Village, Massachusetts, 1692. The Doctor wishes to effect repairs to his ship in peace and privacy, and so his companions - Ian, Barbara and Susan - decide to 'live history' for a week or so. But the friendships they make are abruptly broken when the Doctor ushers them away, wary of being overtaken by the tragic events he knows will occur. The Witch Hunters is one of only two purely historical adventures that we know of in any of the ranges (The Roundheads by Mark Gatiss being the other). Although it was not his first published Doctor Who book, it was the first that Lyons wrote, and he kept it "on ice" until its publication in 1998. Sit back with a nice pail of filthy prison drinking water and relax as we talk about The Witch Hunters! Email us at dwbcpodcast@gmail.com, look for us on Facebook, and follow us on Twitter via @dwbcpodcast. You can also follow Erik via @sjcaustenite and Sean via @tardistavern. Its surface is ravaged by colliding time-fields, the planet Hirath is a patchwork of habitable areas separated by impenetrable zones of wild temporal fluctuation. The planet's unique biosphere is being exploited by an uncaring company happy to rent out temporally isolated chunks of the planet to the highest bidder - no questions asked. But the controlling computer seems to be malfunctioning, and the viability of the whole planet hangs in the balance - along with countless thousands of lives. Arriving at Hirath's control base, the Doctor and Sam are soon separated and trapped on the dying planet. While Sam becomes the focus of attention in a barren penal settlement, the Doctor discovers the secret of Hirath's unique condition - just as a race of hideous bloodthirsty alien creatures arrive in force to reclaim it. We've never read a novel by Collier before, more than likely because he's only penned one other book, the Eighth Doctor Adventure The Taint, which introduces Fitz. To our knowledge, these are the only two novels that he has written. So pour yourself a glass of narcomilk and sit back and relax as we review Michael Collier's Longest Day. You can email us at dwbcpodcast@gmail.com, follow us on Twitter via @dwbcpodcast, and look for our page on Facebook. You can also follow Erik on Twitter via @sjcaustenite and Sean via @tardistavern. According to the Doctor, this isn't a parallel universe, it isn't an alternate timeline, and everything is running according to schedule. But now something, somewhere, has gone wrong. The Nazis are building a secret weapon, one that will have a decisive effect on the outcome of the war. Chris thinks it's a UFO, while Roz believes that the Luftwaffe have developed the largest bomber ever built. Only Benny may have seen the mysterious craft - but she's disappeared off the face of the Earth. Just War is Parkin's first novel, and he wrote it while studying for his MA in Post-War English Fiction. This is his fourth novel that we've read by Parkin, the others being The Infinity Doctors, Cold Fusion, and The Dying Days. Kick back, pour yourself a tall glass of German beer, and listen in as we discuss Lance Parkin's Just War. You can follow us on Twitter via @dwbcpodcast, email us at dwbcpodcast@gmail.com, and also look for us on Facebook. Also feel free to follow Erik via @sjcaustenite and Sean via @tardistavern. As the bck cover suggests, this story is sandwiched between "The Stones of Blood" and "The Androids of Tara" and, to our knowledge, is the only book in the four series that we cover featuring Romana I. The facts that it's a sequel to a popular story and that it takes place during the Key to Time quest make this an intriguing entry in our little library. So sit back, pour yourself some tea, and listen in as we discuss The Shadow of Weng-Chiang. Look for us on Facebook, send us email at dwbcpodcast@gmail.com, and follow us on Twitter via @dwbcpodcast. You can also follow Erik on Twitter via @sjcaustenite and Sean via @tardistavern. It is the year 2146. Answering a distress call from the dilapitated Hotel Galaxian, the TARDIS crew discover a games enthusiast is using the hotel to host a murder-mystery weekend. But it seems someone from his motley group of guests is taking things a little too seriously. While the Doctor, Ben, and Polly find themselves joining in the shadowplay, it becomes clear that a real-life murderer is stalking the dark, disused corridors of the Galaxian. But worse than this: there's a sinister force waiting silently in space for events to unfold. A terrible secret is hidden on board the Galaxian, and if it is discovered nothing - least of all murder - will ever be the same again. If this is a game, the stakes just got higher. Set between "The Power of the Daleks" and "The Highlanders", The Murder Game was the second in the BBC Past Doctors series. It's also the unofficial first appearance of the sonic screwdriver (or rather its prototype). Sit back, pour yourself some bitter beer, and listen in as we discuss Steve Lyons' The Murder Game. Be sure to look for us on Facebook, email us at dwbcpodcast@gmail.com, and follow us on Twitter via @dwbcpodcast. You can also follow Erik via @sjcuaustenite and Sean via @tardistavern. We first read Lawrence Miles’ some time ago with Alien Bodies, then paid him a brief return visit with The Adventuress of Henrietta Street, and now we’re going to crack open the two-book story that became a turning point for many readers of the Eighth Doctor series: Interference, Books One and Two. Five years ago, Sam Jones was just a schoolgirl from Shoreditch. Of course, that was before she met up with the Doctor and discovered that her entire life had been stage-managed by a time-travelling voodoo cult. Funny how things turn out, isn’t it? Now Sam’s back in her own time, fighting the good fight in a world of political treachery, international subterfuge and good old-fashioned depravity. But she’s about to learn the first great truth of the universe: that however corrupt and amoral your own race may be, there’s always someone in the galaxy who can make you look like a beginner. Ms Jones has just become a minor player in a million-year-old power struggle…and, as it happens, so has the Doctor. The story features the Eighth Doctor, Sam, and Fitz, of course, but also brings back Sarah Jane Smith, 20 years old from when the Doctor dropped her off at the end of “The Hand of Fear”. And, as the cover of the book promises, the Third Doctor will be making an appearance with his (younger) Sarah Jane Smith. If all of this sounds a bit confusing, then buckle your seatbelts because, love it or hate it, Interference is one of the most polarizing stories in all of Doctor Who history. So sit back, open the hotel room wet bar, and listen in as we discuss Interference: Book One by Lawrence Miles! Feel free to email us at dwbcpodcast@gmail.com and follow us on Twitter via @dwbcpodcast. You can also follow Erik via @sjcaustenite and Sean via @tardistavern. We first read Lawrence Miles' some time ago with Alien Bodies, then paid him a brief return visit with The Adventuress of Henrietta Street, and now we're going to crack open the two-book story that became a turning point for many readers of the Eighth Doctor series: Interference, Books One and Two. Five years ago, Sam Jones was just a schoolgirl from Shoreditch. Of course, that was before she met up with the Doctor and discovered that her entire life had been stage-managed by a time-travelling voodoo cult. Funny how things turn out, isn't it? Ms Jones has just become a minor player in a million-year-old power struggle...and, as it happens, so has the Doctor. The story features the Eighth Doctor, Sam, and Fitz, of course, but also brings back Sarah Jane Smith, 20 years old from when the Doctor dropped her off at the end of "The Hand of Fear". And, as the cover of the book promises, the Third Doctor will be making an appearance with his (younger) Sarah Jane Smith. Many legends speak of this world, home of an ancient empire destroyed by its own greatest achievement. The Highest Science, the pinnacle of technological discovery. You may remember Gareth Roberts from our review of the Missing Adventure The Well-Mannered War (also featuring the Chelonians, who made their first appearance here) and television episodes such as “The Lodger”, “Closing Time”, and the very recent “The Caretaker”. So…without further ado, sit back, relax, grab a can of bubbleshake, and listen in as we discuss Gareth Roberts’ The Highest Science. Look for us on Facebook, email us at dwbcpodcast@gmail.com, and follow us on Twitter via @dwbcpodcast. You can also follow Erik via @sjcaustenite and Sean via @tardistavern. You may remember Gareth Roberts from our review of the Missing Adventure The Well-Mannered War (also featuring the Chelonians, who made their first appearance here) and television episodes such as "The Lodger", "Closing Time", and the very recent "The Caretaker". So...without further ado, sit back, relax, grab a can of bubbleshake, and listen in as we discuss Gareth Roberts' The Highest Science. Jo is sent on a top-secret mission to the war-torn Arab nation of Kebiria. But upon arrival, she is immediately arrested and consigned to a brutal political prison. The Kebirians have something to hide: deep in the North African desert, an alien infestation is rapidly growing. And the Doctor and UNIT soon discover that unless stopped, the alien presence will spread to overrun the entire world. You may know Paul Leonard from such books as Venusian Lullaby, Speed of Flight, and the Bernice Summerfield Virgin novel Dry Pilgrimage (co-authored with The Fall of Yquatine author Nick Walters). After 44 episodes, it was inevitable that we covered a book written by Leonard, since he has penned so many. So, pull up a cup of honey wine, and relax, as we discuss Paul Leonard’s Dancing the Code. So, pull up a cup of honey wine, and relax, as we discuss Paul Leonard's Dancing the Code. Of course, Mark Gatiss is well known for writing such televised episodes as “The Unquiet Dead”, “Cold War”, “The Crimson Horror”, and (gulp!) “Victory of the Daleks”. After Russell T. Davies, he’s probably the author with the highest profile whose work we have read. Before The Roundheads, Gatiss wrote the Virgin New Adventure Nightshade. The Roundheads remains one of the very few (two, by our count) pure historical adventures published in the four main ranges of books. Pull up a mug of ale and sit back and relax as we discuss The Roundheads! Please feel free to email us at dwbcpodcast@gmail.com and follow us on Twitter @dwbcpodcast. You can also follow Erik via @sjcaustenite and Sean via @tardistavern. Of course, Mark Gatiss is well known for writing such televised episodes as "The Unquiet Dead", "Cold War", "The Crimson Horror", and (gulp!) "Victory of the Daleks". After Russell T. Davies, he's probably the author with the highest profile whose work we have read. Before The Roundheads, Gatiss wrote the Virgin New Adventure Nightshade. The Roundheads remains one of the very few (two, by our count) pure historical adventures published in the four main ranges of books. You may know Simon Messingham from his New Series Adventure The Doctor Trap, as well as Zeta Major, Tomb of Valdemar, The Indestructible Man, and The Infinity Race. So…sit back, heat up a cube of non-alcoholic bourbon, and listen in as we discuss The Face-Eater. The Doctor and Sam arrive on Proxima II, one of the earliest planets colonised in humanity's first big push into space. But instead of a brave new world, they find a settlement rife with superstition and unrest. You may know Simon Messingham from his New Series Adventure The Doctor Trap, as well as Zeta Major, Tomb of Valdemar, The Indestructible Man, and The Infinity Race. So...sit back, heat up a cube of non-alcoholic bourbon, and listen in as we discuss The Face-Eater. Swordplay, samurai, magic, aliens, adventure, excitement…Who needs them? As villagers are healed and crops grow far too fast, the Doctor and Chris try to find the secret of the miracles – before two rival armies can start a war over who owns the god. Chris soon finds himself alone – except for an alien slaver, a time-traveling Victorian inventor, a gang of demons, an old friend with suspicious motives, a village full of innocent bystanders, and several thousand samurai. Without the Doctor, someone has to take up the challenge of adventure and stop the god falling into the wrong hands. Someone has to be a hero – but Chris isn’t sure he wants to be a hero any more. Orman has written just over a dozen novels for the different ranges, including one for Telos Publishing and another in Virgin’s series of Benny Summerfield novels. It’s notable that she became the first female writer in the series with the debut of The Left-Handed Hummingbird. Sit back, relax, pour yourself a thimbleful of sake, and listen in as we discuss The Room with No Doors. Please feel free to email us at dwbcpodcast@gmail.com and follow us on Twitter via @dwbcpodcast. You can also follow Erik via @sjcaustenite and Sean via @tardistavern. Swordplay, samurai, magic, aliens, adventure, excitement...Who needs them? Chris soon finds himself alone - except for an alien slaver, a time-traveling Victorian inventor, a gang of demons, an old friend with suspicious motives, a village full of innocent bystanders, and several thousand samurai. Without the Doctor, someone has to take up the challenge of adventure and stop the god falling into the wrong hands. Someone has to be a hero - but Chris isn't sure he wants to be a hero any more. Orman has written just over a dozen novels for the different ranges, including one for Telos Publishing and another in Virgin's series of Benny Summerfield novels. It's notable that she became the first female writer in the series with the debut of The Left-Handed Hummingbird. The Network broadcasts entertainment to the planets of the Meson system: Death-hunt 3000, Prisoner: The Next Generation, Bloodsoak Bunny... Sixteen channels, and not one of them worth watching. But for the citizens of poverty-stricken Torrok, television offers the only escape from a reality too horrible to face. Angela, a young inhabitant of Torrok, leaps at the chance to travel to the Network with a hermit who calls himself the Doctor. However, all is not well on the giant, chaotic space station. A soap star has murdered his wife's lover; the robotic regulars of Timeriders are performing random kidnappings; and a lethal new game show is about to go on air. Can the Doctor uncover the cause of the apparently random disturbances - or will his appearance as a competitor on Death-hunt 3000 be the last of his life? We're firm believers of "In Lyons We Trust" on this podcast, thus our sterling reviews of his books Conundrum and The Crooked World. Will Time of Your Life be any different? Grab a tasty glass of boiling water, sit back, and relax as we discuss it! The Network broadcasts entertainment to the planets of the Meson system: Death-hunt 3000, Prisoner: The Next Generation, Bloodsoak Bunny… Sixteen channels, and not one of them worth watching. But for the citizens of poverty-stricken Torrok, television offers the only escape from a reality too horrible to face. Angela, a young inhabitant of Torrok, leaps at the chance to travel to the Network with a hermit who calls himself the Doctor. However, all is not well on the giant, chaotic space station. A soap star has murdered his wife’s lover; the robotic regulars of Timeriders are performing random kidnappings; and a lethal new game show is about to go on air. Can the Doctor uncover the cause of the apparently random disturbances – or will his appearance as a competitor on Death-hunt 3000 be the last of his life? We’re firm believers of “In Lyons We Trust” on this podcast, thus our sterling reviews of his books Conundrum and The Crooked World. Will Time of Your Life be any different? Grab a tasty glass of boiling water, sit back, and relax as we discuss it! This month we turn our sights on BBC's Past Doctors Adventures with Loving the Alien, a novel featuring the Seventh Doctor and Ace by Mike Tucker and Robert Perry. Mike Tucker might best be known for his model work on the current televised series, but he has written a plethora of books, including Ace! with Sophie Aldred, a number of novels with the Seventh Doctor and Ace in the BBC range, and two novels featuring the Tenth Doctor in the New Series Adventures. Tucker also co-write Illegal Alien with Robert Perry, who has written for such television shows as EastEnders and Family Affairs. To find the truth the Doctor makes a dangerous decision and takes the unsuspecting Ace to the very time and place of her death, hoping to cheat Time and find her killer before he can strike - but Time has other ideas. With Ace missing and the clock ticking the Doctor turns to old friends for help and finds that there is unfinished business for him to deal with. With that, please help yourself to a strawberry soda from the drug store fountain, put your feet up, and relax as we review Loving the Alien. Look for us on Facebook, email us at dwbcpodcast@gmail.com, and follow us on Twitter via @dwbcpodcast. Also feel free to follow Erik via @sjcaustenite and Sean via @tardistavern. This month we turn our sights on BBC’s Past Doctors Adventures with Loving the Alien, a novel featuring the Seventh Doctor and Ace by Mike Tucker and Robert Perry. To find the truth the Doctor makes a dangerous decision and takes the unsuspecting Ace to the very time and place of her death, hoping to cheat Time and find her killer before he can strike – but Time has other ideas. With Ace missing and the clock ticking the Doctor turns to old friends for help and finds that there is unfinished business for him to deal with. What is the secret experiment being conducted by the British Rocket Group? Why are giant ants appearing in the suburbs of 1950s London? Who is the mysterious figure that is watching the Doctor’s every move? Special Episode: An Interview wth "Who's 50" Authors Graeme Burk and Robert Smith? This February we seized the chance at Gallifrey One to sit down with Graeme Burk and Robert Smith?, authors of Who’s 50, a celebration of the 50th anniversary of Doctor Who featuring “the 50 Doctor Who stories to watch before you die”. Sit back, pour yourself a glass of cabernet, and relax as we discuss Who’s 50 with Graeme and Robert. Once again, look for us on Facebook, email us at dwbcpodcast@gmail.com, and follow us on Twitter via @dwbcpodcast. You can also follow Erik via @sjcaustenite, Sean via @tardistavern, and Graeme Burk via @graemeburk. This February we seized the chance at Gallifrey One to sit down with Graeme Burk and Robert Smith?, authors of Who's 50, a celebration of the 50th anniversary of Doctor Who featuring "the 50 Doctor Who stories to watch before you die". Sit back, pour yourself a glass of cabernet, and relax as we discuss Who's 50 with Graeme and Robert. On February 9, 1783, a funeral was held in the tunnels at the dead heart of London. It was the funeral of a warrior and a conjurer, a paladin and an oracle, the last of an ancient breed who’d once stood between the Earth and the bloodiest of its nightmares. And then there was Scarlette’s accomplice, the ‘elemental champion’ who stood alongside her in the final battle. The one they called the Doctor. Lawrence Miles is, perhaps, best known as the author of Alien Bodies (be sure to listen to our sterling review of it) as well as a handful of other Eighth Doctor novels. Grab a glass of milk, relax, sit back, and enjoy our discussion of The Adventuress of Henrietta Street. Be sure to find us on Facebook, follow us on Twitter via @dwbcpodcast, and email us at dwbcpodcast@gmail.com. Also follow Erik via @sjcaustenite, Sean via @tardistavern, and Deb via @debstanish. Then the peace is shattered by a murder. As the suspects proliferate, Bernice realises that even an artificial world has its buried secrets and Roz discovers what she’s always suspected – that every paradise has its snake. You probably know Ben Aaronovitch as the author of the televised stories “Remembrance of the Daleks” and “Battlefield”, as well as the Virgin New Adventures Transit and So Vile a Sin. Grab a bottle of antisocial, sit back, and relax as we review The Also People.